Tandoori tacos are a scrumptious reincarnation of the original. They have chunks of paneer and a colorful spread of vegetables which are roasted and marinated in tandoori spices to have that authentic Indian flavour. The preparation of fresh avocado crema adds some piquant Mexican fun while the pickled purple cabbage and onion add a pickly thrill to it. 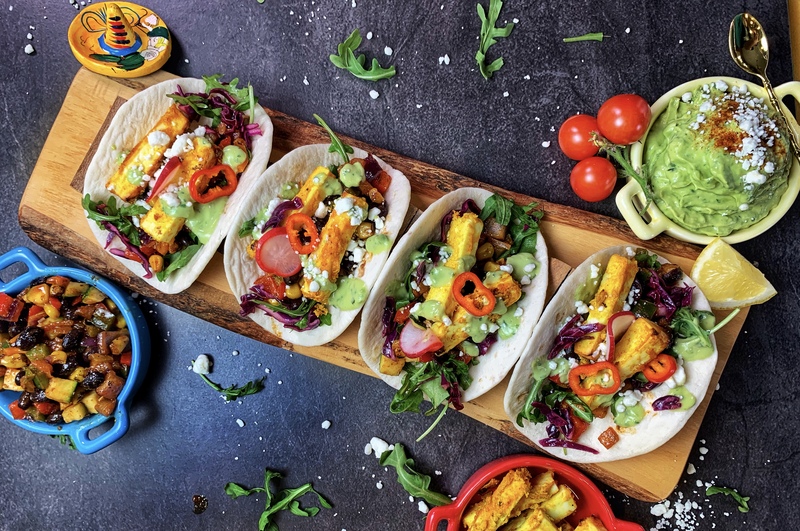 These tandoori tacos are a must try for taco lovers. If you are looking for a good option for Sunday brunches or children’s lunch boxes, these are perfect! It’s a complete heart winning preparation with all the spicy, smokey, and zesty flavor can imagine, all rolled into one tortilla!! For the paneer (or tofu) marination, mix all of the ingredients in a bowl and whisk together. Put in the pieces of paneer (or tofu) and set aside for 15-20 minutes. Overnight would work great too. Blend all of the ingredients for the avocado crema in a food processor. Set aside in a separate bowl. Mix all of the ingredients for the slaw and set aside in a separate bowl. For the veggie filling, grill everything in a saucepan on high heat until the vegetables have browned and flavors are incorporated. Set aside in a bowl. Grill the paneer (or tofu) for 7-8 minutes in a baking tray. It should get a nice char on the outside. This step can also be done on the stove too with a pan. Either way, don’t dry out the paneer. Time to assemble! Grill the tortillas and add a layer of slaw. Then top it with the vegetables and pant, finally drizzling it with the crema. Garnish with some jalapeños, lime, radish, and feta!